In post-WWII Britain, a 93-year-old Sherlock Holmes is losing his wits, because oldness. Desperate to remember the case that made him quit detecting forever, he travels to Japan to find a cure for his failing mental faculties. But the only thing that really helps is spending time with his bitchy housekeeper's son, Roger. As I mentioned in my Sunday Snapshot, Mr. Holmes is all over the place. It jumps from 1947 Britain to 1920-ish Britain, to Japan, and back again, and the transitions can be rather abrupt. 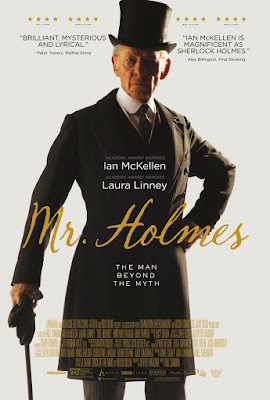 As a fan of all things Sherlockian, I did not find this movie enjoyable, although it did have some interesting ideas. I don't think Mr. Holmes betrays the Sherlock canon, but there are several points where I feel it went it wrong. First of all, there's no Watson, nor any Watson character–the story is told through Sherlock's eyes. BIG mistake. I love Sherlock, but there's no way he can be a sympathetic everyman. That's Watson's (or Mary Russell's, or whomever's) job. Holmes' job is to be weird and not boring. Secondly, the mystery element is miniscule. I was expecting way more detecting than whatever the hell else was going on in this movie. And while I enjoyed the mystery, there were moments when it was head-slappingly stupid. There was a sequence where Holmes followed a woman through London and his only method of subterfuge was to peek around the edges of pillars and the like. While wearing a top hat and a three-piece suit and tails, no less, as if he's going to the Ritz! Wasn't Holmes supposed to be a master of disguise? C'mon, movie makers. Try harder. If he needs a brain/energy boost, why doesn't Holmes just take cocaine instead of traveling all the way to Japan for prickly ash? I'm supposed to believe that Holmes, or anyone really, would let some random lady move in with them after knowing her for less than hour? Right. Totally. Not. Holmes feels guilty for killing said woman, as if he failed to warn her about a bus veering down the road or something, but she didn't just die. She made the choice to kill herself. He was like, "Hey, don't kill yourself, you have a lot to live for," and she was like, "Oh, you're right, I won't," and then she decided to just go ahead and do it anyway. If anyone should feel bad, it should be her Awful Person husband. I find it very difficult to believe Holmes would feel so guilty about this that he'd give up detecting, even if the two of them shared some sort of instantaneous metaphysical connection. Which I think is improbable. Throughout the whole movie there's a "mystery" about what's killing Holmes' bees. Then Roger gets stung and Holmes is like, "Oh, it must be wasps!" THE WASP NEST IS LITERALLY RIGHT OUTSIDE THE HOUSE. Like three feet, and it's freaking huge. He didn't notice a bunch of wasps flying around when he was out there ALL THE TIME? The oddest thing in this movie is when Holmes writes to Mr. Umezaki to tell him that his father didn't just abandon him and his mother, but decided to become an asset for Mycroft and the War Office, where he served with distinction. This is, presumably, a fiction on Holmes' part meant to make Umezaki feel better. But would thinking your father left you to spy for the Allies who just dropped two atomic bombs on your country *really* make anyone feel better? "Your dad betrayed his country. Hope this helps!" Visually, the Japan sections of the movie were the most striking, but they had zippo to do with anything else in the plot. Their main purpose was to underscore what I think of as the ungrieved-for dead–a term from Anne Roiphe's memoir Art and Madness that she uses to describe the zeitgeist that infused post-War America. And everywhere in Mr. Holmes there are dead people, from Glass Harmonica Woman's dead kids, to the woman herself, to the housekeeper's dead husband (whom she talks about at length on randomly and apropos of nothing, e.g. Housekeeper: "Your dad wanted to join the RAF instead of working on cars." Roger: "Sorry I said you could barely read." Cool talk, bro? ), to dead Watson and Mycroft. Holmes' challenge is just to remember them and acknowledge their loss. The final scene of Mr. Holmes seems to draw a loose parallel between the woman who committed suicide and the dropping of the atomic bomb on Hiroshima, as well as Holmes' subsumed guilt over the act and deliberate (or perhaps self-preservational) amnesia. An interesting theme to explore, but why use Sherlock Holmes to do it? That's what really confuses me about this story. Holmes is a symbol of Victorian London. Why is he being employed as a stand-in for the War Generation? I honestly have no idea, but I think pairing Holmes with this theme was misplaced and did not serve either the character or the story. It would have been much more poignant and believable if he'd been an average old guy. I will say on the positive side that Ian McKellen, Laura Linney, and Milo Parker were fantastic in this. McKellen really has that old man face nailed down. I was also relieved Holmes didn't die at the end–at least the filmmakers knew not to do that much.